One annoying thing we found was that the Sanguinolulu board was pulling power from the USB cable even when the main power was off. The USB cable sends 5V from the computer which was enough to light the LED and keep our fans spinning (slowly). Previously we would just disconnect the USB cable every time we turned off the printer and reconnect it after turning it on. We decided to cut the 5V line in the USB cable. Most normal pre-3.0 USB cables have 4 wires (ground, 5V, and 2 data) and the 5V line is not needed to pass data. 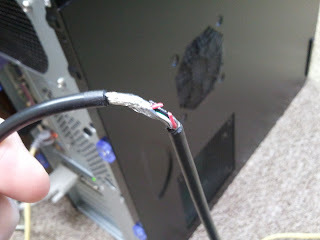 We sliced the USB cable open and cut the 5V line (red wire), problem solved. Our USB cable stays connected all the time now.